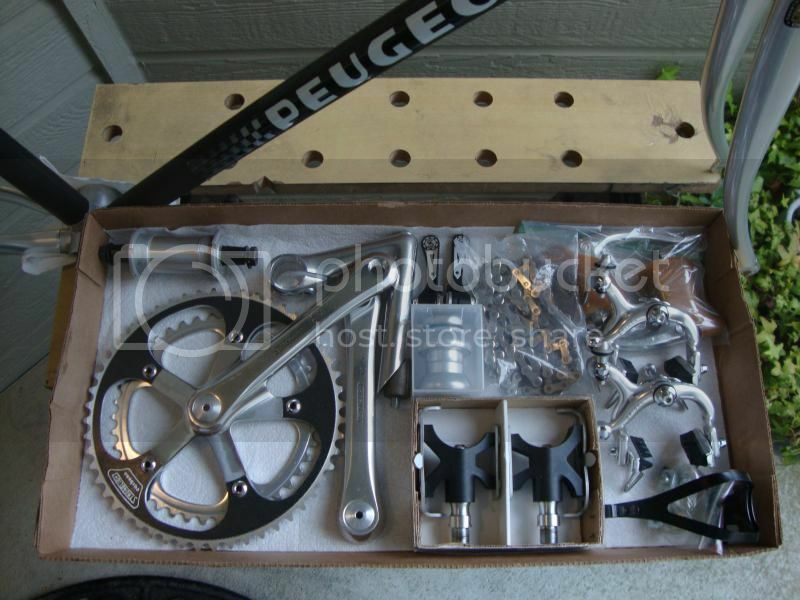 A Personal Ultiamte Grail bike, The Peugeot PY10FC, finally for me to build! A personal ultimate grail bike, The Peugeot PY10FC, finally for me to build! Thanks very much to fellow C&V member John ("jyl"), my decades long dream to own a Peugeot PY10FC is finally realized when this beautiful Peugeot PY10FC frameset was delivered to my house late yesterday afternoon. I've been wanting one of these since I first saw it in Peugeot catalogs in the mid 80's, and jyl's example is surely one of the best I ever ran across in many years as lots of the ones I've seen out there are all beat to hell. 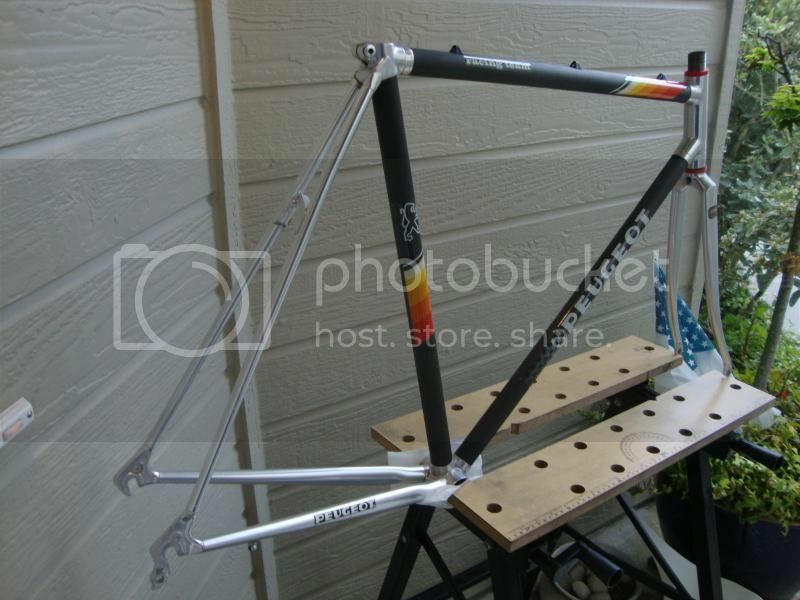 The The frame is close to mint and looks like it might have been a whole bike at one time (IIRC, the PY10FC was sold as both a full bike or just a frameset) and maybe parted out for the Simplex/Stronglight/Weinmann Carrera components for maybe an 80's French bike project. Even all the aluminum frame tube end reinforcing rings are all intact on the frame. For some reason, on PY10FC's that obviously lived hard lives seem to lose these rings, so just having these on the frame is a very good sign that this one was not abused and likely lived most of its life in a dry climate. Peugeot seemed to have avoided installing water bottle and shifter bosses on the DT to maybe assure that the DT strength and integrity will not be compromised. It might also had something to do with the single direction the CF fibers are running on the frame tubes. Last edited by Chombi; 04-20-14 at 01:16 AM. Beautiful! Both the frame and the 'gruppo'. Looking forward to the results. Glad you found your grail frame chombi. The frame looks stunning. I love the peugeot stripes (is there a specific name for them)? Thats quite the groupset you collected there as well. Looking forward to the finished product! Gorgeous frame!! When I saw the pics I thought it was NOS. Glad you got one of your grail bikes, I definitely know what that feels like after you've been searching for so long. Beautiful, one of a kind build. What rims are you going to use? Fantastic, Chombi. You GO guy! That will be a special, smooth rider. I like the colors also. Looks all business. I'll be transferring my Wolber Profil 20 tubulars with Stronglight Delta 28H hubs and SS DT oval spokes from my Vitus Carbone to this bike. For a change, this will be a "Non-Mavic, Tout French" build. Too cool man! Very nice! Very nice. I like the non campy/Shimano build on that frame. Love this frame! Looking forward to the build. 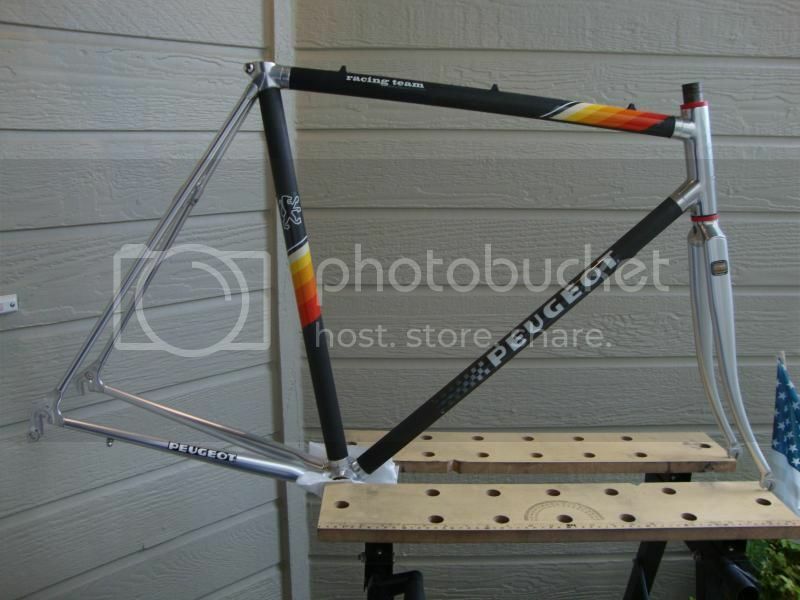 My first road bike was a lesser Peugeot with those stripes. Chombi - congrats. I hope it's everything you dream and rides like it has a firecracker in the seattube. Wow, what a looker! That will be fun. Wow, that will be some build! vraiment magnifique mon vieux !!!! Gonna be a sweet, sweet build! Everything looks brand spanking new, too. As for the build intent for this PY10FC frameset, I'm working towards a "Tout French" build again, but this time I'm avoiding making it a Mavic build, so all the components I will install on the frame are mostly Stronglight/Spidel/Simplex (mostly Stronglight Delta), which was what brands Peugeot use to build their pro and "civilian" versions of the PY10FC's. They also represented the slightly more modern component lines from the makers that I think with the then "forward tech" CF frameset the PY10FC had. Atax aero 22.2 diameter quill stem with 110 extension. 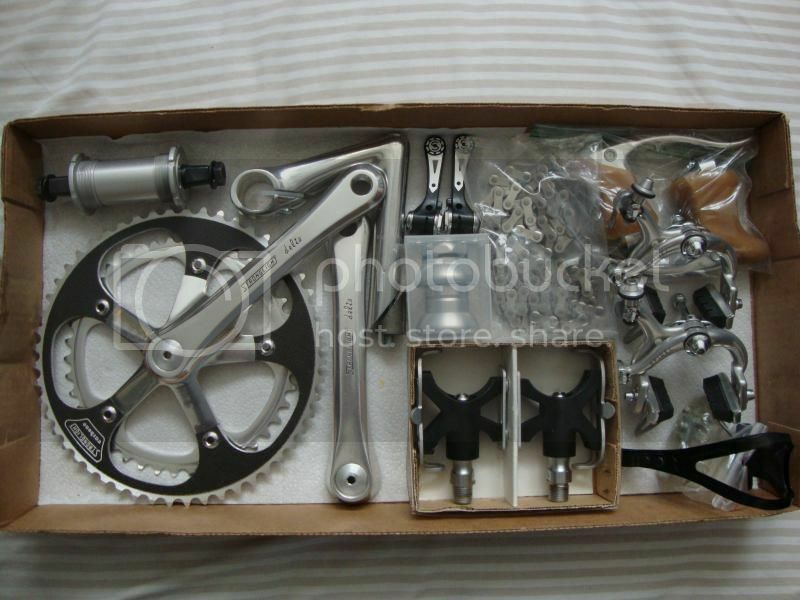 The hardest to get in this missing group of components will be the derailleur set, as Simplex SLJ6600's are just so overpriced (IMO) when they pop up at eBay. The stand in Mavic 851 SSC derailleur set will look and work good on the bike, but will stand out like a sore thumb too within the mostly non-Mavic groupset. So, the derailleur department might be a work in progress for a whill even after the bike is already in rideable condition. 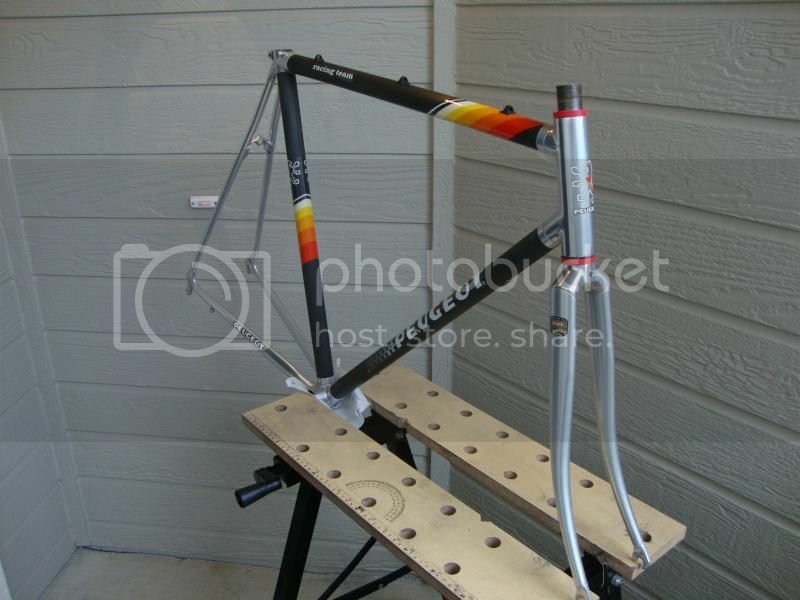 I could have tried for a Stronglight 107/Spidel/Weinmann build like how the bikes came from Peugeot, but, for some reason I never was able to land a good 107 crankset after some years of searching (the ones with 9/16 pedal threads which are so rare). So the Delta cranks with the CF garnishing on its big ring is what naturally fell into palce for the build. I also think that the Weinmann Carrera brakeset that they used on the bike for both pro and civilian versions just never seem to belong to the bike, being a Swiss/German brand. I think Peugeot used them because they worked well and maybe also it's a contractual obligation with Weinmann to put them on the top model and race them at the pro circuit as they supplied Peugeot with jillions of brakesets for their mid and lower model bikes, which is the bulk of their business. Fortunately, this would not be so hard a build, as the frame is in such great condition, so there's just a little bit of cleaning and polishing up to get it ready to accept the components. What will take a bit of time would be finding/ buying the missing components, as my C&V budget in the last couple of years had been severly limted because of slow business and short hours at work .... but things are just starting to look up at work just in time to be able to buy this grail frame from John ("jyl") .... It's just really great when thing like these just work out, especially when a friend at BF C&V forums is the one to help you out! Thanks very much again John!! Last edited by Chombi; 04-20-14 at 04:05 PM. Beautiful frame and the gruppo looks great too. Happy to hear you found your "grail" bike. Congratulations! What a stunning beauty. The emotional satisfaction of landing one's primary grail is indescribable -- but the images sure help. We'll look forward not only to the build report, but also to the ride report. Congratulations, chombi! I'm so happy the frame is with you and will finally get the build it deserves. I'll tell a story. Chombi and I were both looking for this frame and in 2011, I think, he saw this one. At the time I was in a position to buy it and he wasn't, so he generously alerted me to it and I bought it. I love the frame and tried to collect the parts necessary for a Robert Millar/TdF-replica build, but the task and budget required eventually defeated me. Time passed, during which I saw more of chombi's perfect builds - the Lineseeker especially - and when the stars aligned and chombi was in a position to buy the frame, it was high time for the PY10FC to go from its brief caretaker to its true owner, who has been patiently collecting perfect French parts for years and years. It is a beautiful, evocative frame with oodles of racing heritage. Even my wife was sorry to see it go. Chombi, that is very interesting that the carbon tubes were apparently different from the Vitus Carbone 7. Was the Carbone 7 available in 1983 (?) when the PY10FC was introduced? Do you think this model is the first carbon fiber bike to race in the TdF? Chombi, I love your builds. Can't wait to see this one finished. Congrats, Chombi! This is going to be a stellar bike, and a wonderful addition to your vintage CF fleet. Fantastic assemblage of parts, too. I dig the look of those Assos pedals. Wow, it's immaculate! I can't wait to see this completed. Congrats Chombi.